A new whitepaper designed to help the European Postal and Logistics industry address the challenges of “last mile” delivery through the use of technology has been published today by rugged mobile device manufacturer Panasonic Toughbook and Zetes, an innovative technology company helping businesses achieve agility, visibility and traceability across their end-to-end connected supply chain. With the explosion of ecommerce, the pressures on the postal and logistics industry and its workforce are increasing. Online sales across are Europe are expected to rise to €450.2 billion by 2021 – a compound annual growth rate of 14%. This change in business and consumer buying habits has had a massive impact on the postal and delivery industry, with a 69% increase in European parcel deliveries forecast by 2021. With this increased workload has come an urgency to find new, more efficient and effective ways of working, as the technology infrastructure and the workforce struggle under the strain. 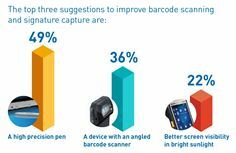 Independent research has shown that 60% of workers from the delivery, warehouse and logistics industry feel their mobile barcode scanner device is only fairly effective or not effective at all. These devices are already being used to scan an average of 197 times per day and workers predict year-on-year growth of 24%. The dramatic increase in workload – combined with outdated technology – is also having an impact on workforce health. More than 60% reported suffering from wrist or arm aches and pains, with 69% forced to take time off for an average of 2.75 sick days in the past 12 months. Repetitive Strain Injury (RSI) also affected 52% of the workforce, with 78% of those affected having to take an average of 3 sick days in the past 12 months.